Punjab Boards intend to announce Matric Exam Result 2018 on 21st July 2018. The representatives of different Boards of Punjab have told that all the eight boards of Punjab will declare Matric annual examination result on the same day, that is on July 21, 2018 at 10:10 AM. 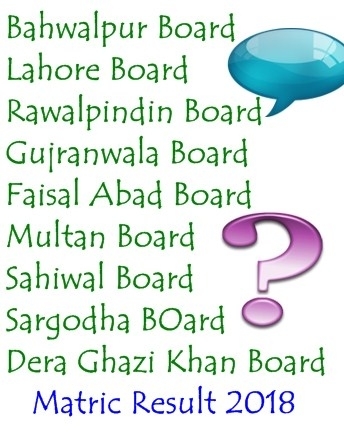 A list of all Punjab BISE Boards is given below. You can Check Matric Exam Result 2018 of all BISE Boards, by clicking on the name of concerned BISE Board and filling the necessary information like Roll Number of the student of Matric Exam Result 2018 . These above mentioned Education Boards -BISEs of Punjab cover 37 districts of Punjab Province.